Looking forward to the development of a global climate agreement in 2015, representatives from mountainous Least Developed Countries from Africa and Asia raised a common voice for the mountains and the need for an equitable share of global climate funds to be allocated to address the impacts to climate change and support adaptation in the mountains. 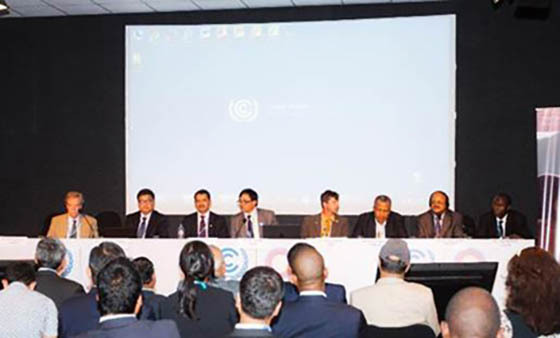 A high-level side event organized at the 20th Conference of the Parties to the United Nations Framework Convention on Climate Change (UNFCCC) in Lima, Peru, brought together delegates from the governments of Nepal, Bangladesh, Bhutan, and Uganda, as well as representatives from the Secretariat of the UNFCCC, the International Centre for Integrated Mountain Development (ICIMOD), and the Swiss Agency for Development and Cooperation (SDC) to discuss the challenges of climate change in mountain areas. Over 80 delegates from the conference attended the event on ‘Changing Climate in the Mountains: How least developed countries are coping and planning long-term responses’, which was organized jointly by ICIMOD and the Ministry of Science, Technology and Environment (MoSTE), Government of Nepal (GoN). Dr David Molden, Director General of ICIMOD, drew a comprehensive picture of the Hindu Kush Himalayan region, where it is becoming increasingly difficult for normally resilient mountain people to adapt to rapid changes resulting from climate change and other drivers of change. 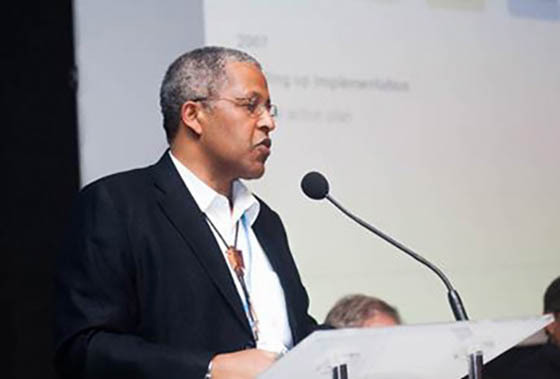 Highlighting entry points for mountains within the UNFCCC process, Paul V Desanker, Manager of the National Adaptation Plans and Policy Adaptation Programme at the UNFCCC Secretariat, highlighted important outcomes of the Lima Climate Change Conference on adaptation, including progress on National Adaptation Plans (NAPs) and under the Nairobi Work Programme (NWP). He further added that the recent growth of the Green Climate Funds (GCF) reflects the growing emphasis of countries around the world on supporting effective adaptation. mountain areas are facing”, said Desanker. Md. 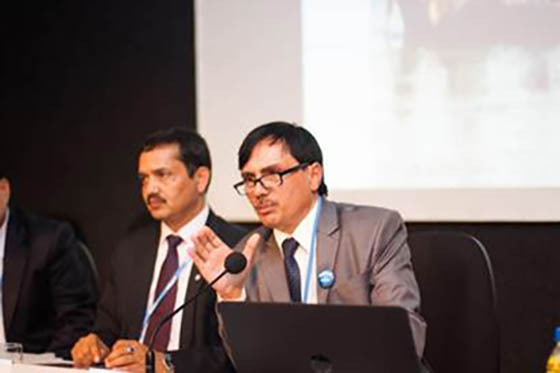 Nojibur Rahman, Secretary of the Ministry of Environment and Forests (MOEF) of the People's Republic of Bangladesh and National Focal Point to the UNFCCC said, “We cannot prevent the advent of climate change in the mountains, but we can definitely minimize its adverse impacts through transboundary cooperation by creating a council in the model of the Arctic Council. We can assist each other in facing the challenges of melting glaciers in the mountains, as well as in managing the abundant water resources in the mountains in a sustainable manner”. Sharing experience from Uganda, Paul Isabirye, from the Climate Change Department of the Ministry of Water and Environment in Uganda and National Focal Point to the UNFCCC, stressed the need to conduct climate profiles and climate vulnerability assessments in mountain ecosystems and to develop policies and laws to facilitate forward-looking actions in the mountains. Many mountainous countries have prioritized climate change adaptation, including the management of hazards and risks with a special focus on the unique challenges present in mountain areas. Vulnerable countries have developed customized approaches and made necessary policy changes to support climate change adaptation. In their efforts to promote adaptation in the mountains, these countries have been supported by development partners in many different ways and approaches. Dr Daniel Maselli, Senior Policy Advisor and Focal Point from SDC, highlighted the prominent role mountains have played in development aid from Switzerland, a founding member of ICIMOD and the Mountain Partnership – a voluntary alliance of mountainous countries. “Economic power is often held outside of mountain regions, but the important global role mountains play calls for support for countries with mountains, particularly LDCs”, said Dr Maselli. “Securing the future of mountain ecosystems and societies will require a new social contract between mountain regions and lowland regions for the benefit of all. There is no time and there are no resources to compete. Collaboration is the attitude required”, he added. 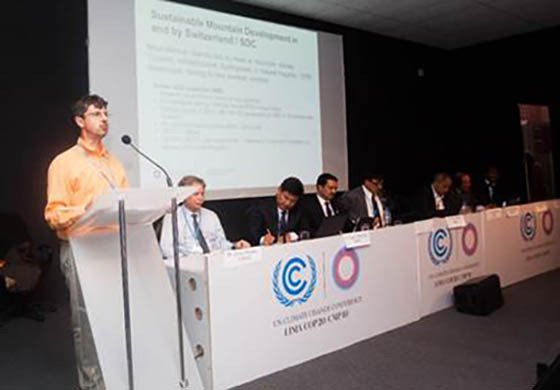 During the plenary, one participant suggested that an active mountain block at the UNFCCC negotiation table could be an effective tool for advocating for the mountains at the global level. Dr Govind Raj Pokharel, Vice Chair of the National Planning Commission of Nepal, recognized the need for investments in the mountains from developed countries, especially given the challenges to private sector investment in the face of increased incidences of disasters. 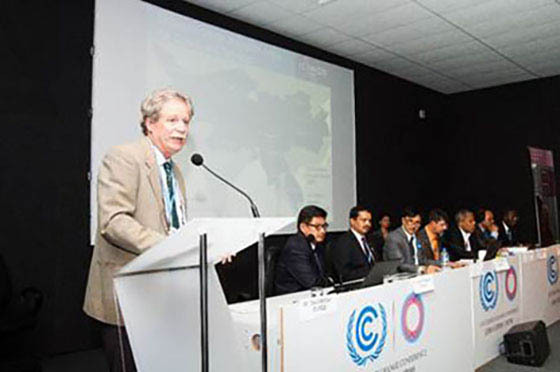 He concluded that the points brought forward during the event must be brought to the negotiation table during the UNFCCC COP 21 in Paris in 2015.